Anyone who follows social media in our fair city would be aware of the popularity and success of the HerCanberra website. This website is “written by Canberra women, for Canberra women” and it is written extremely well. Although the website has had a couple of guest posts from token males (like this one) it has become another good example of Canberra’s amazingly smart, hard-working, talented and outspoken women and is highly-recommended reading. HerCanberra features the voices of local writers, the website posts daily about topics of interest to the Capital’s female population. From ‘what’s on’ to reviews of places to eat; social commentary to health and fitness; beauty and nutrition to books and movies; fashion and motherhood to recipes and home style; if it’s part of ‘her’ life you’ll find it on HerCanberra. If you’ve ever wanted to know who’s behind it, well that would be Amanda Whitley. Amanda jokes that she manages HerCanberra in any ‘spare time’ she might have amongst all her other responsibilities and pursuits yet she manages to attend and investigate an amazing array of Canberra events, openings, celebrations and community festivals, sharing her love for our city with her growing readership both here and interstate. I recently met with Amanda at one of her favourite places in Canberra, Manuka. She shared some secrets about what interests her and what keeps her busy life on track. Amanda Whitley, Who are you? I founded HerCanberra in January 2011 after the premature birth of my youngest daughter led me to leave the public service and start dabbling in the odd blog or two (including being the first site moderator for Mamamia – but I gave that up after refereeing one two many argument over c-sections and childcare). These days, I manage HerCanberra in any ‘spare time’ that’s not spent wrangling two gorgeous little girls, instructing Zumba, or eating. I’ve also done everything from present the tv news to operate a stop and go sign! 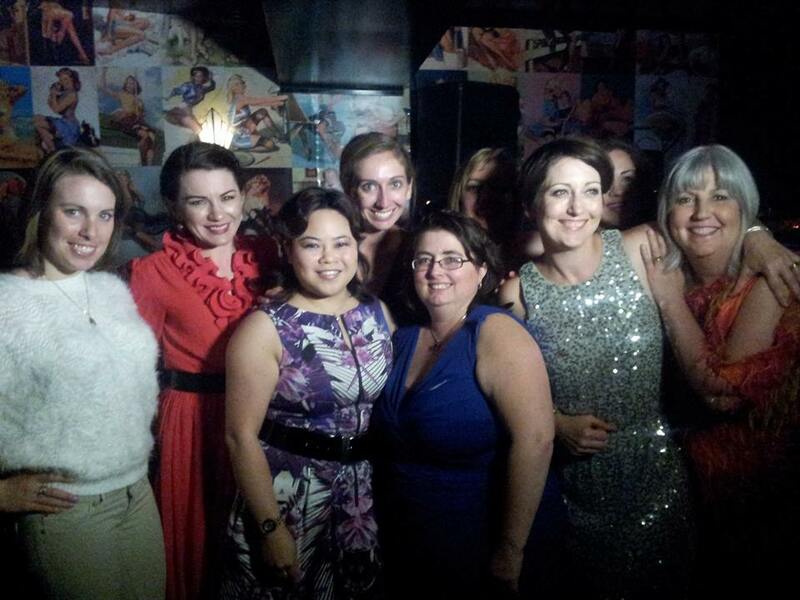 Amanda Whitley with some of the HerCan team at the 2013 Christmas party – 100 people attended (it was sold out). How long have you been writing? I’ve been writing HerCanberra since January 2011 and had a personal blog before that as well as contributing to MamaMia. I worked as Mamamia’s first site moderator and met many Canberra women while I was doing that work. The idea for HerCanberra was something I came up knowing there was a real growing market and demand for stories and news that would be of interest to Canberra women. Other hobbies? When I’m not herding children I teach Zumba with Latin Beat Fitness and I dance with Koco Loco. I also enjoy cooking and reading. Apple or Android? We are a dedicated Apple family! Car/bus/bike? Well, we have two kids so it has to be the car most days to ferry the kids around. Can we take a peek at your homescreen? Most-used App? Facebook without a doubt. What’s the first thing you check online each morning? 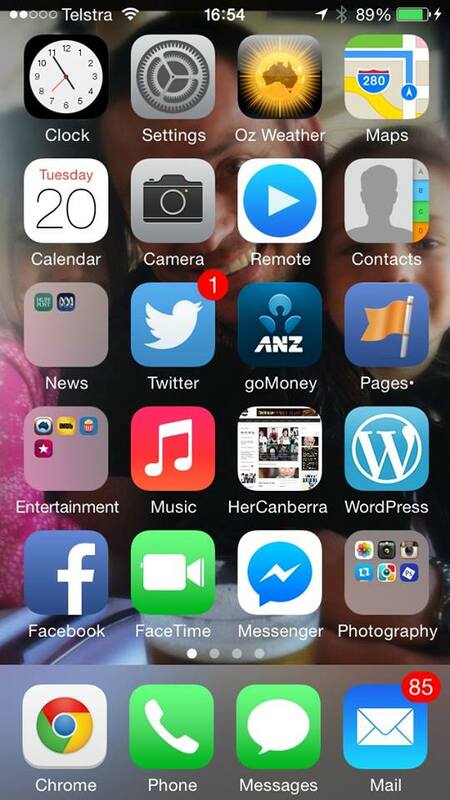 Facebook notifications, emails, website, Canberra Times. What do you worry about at night? All the things I have to do the next day, because there’s only one of me. Most exciting recent news? I was selected as one of the 100 #Humanbrochure particpants by VisitCanberra and am really looking forward to showcasing our beautiful city to the rest of Australia and the world. Recent book you recommend? I love crime novels and really enjoyed A dark and twisted tide by Sharon Bolton. Recent online video you laughed at? Can’t really think of a video I laughed over…but the ‘DYAC’ blog gets me every time…on the first one, I kinda smile, then by the 10th I’m rolling on the floor. Damn you auto correct! Favourite food? 86 is my current favourite place to eat in Canberra. I recommend you take your wife their on a date night Elias! Make sure you tell them you’re on a date and ask to be seated at the kitchen bench where you can watch the chefs, cooks and staff work and interact, you will be entertained. Amanda and HerCanberra can be found on Facebook or Twitter …or listen in to hear Amanda on Radio 2CC at 6:45am each Tuesday to hear what’s on the minds of women in Canberra! This entry was posted in Meet a #Canberra Foodie and tagged amanda, Canberra, CBR, foodie, HerCanberra, Mamamia, whitley, women. thanks Anna. I love doing those interviews. How are your answers going? 😉 We should catch up next week if you have time!